Easy Morel Mushroom Growing Kit Morchella esculenta. We provide the kit and instructions on how to prepare your very own Morel Mushroom patch! CREATE A MOREL MUSHROOM GARDEN IN VERY YOUR OWN BACKYARD!! OUR MOREL MUSHROOM KITS ARE ABSOLUTELY GUARANTEED* TO PRODUCE. WE PROVIDE YOU WITH THE MUSHROOM SPAWN AND SUPER EASY TO USE INSTRUCTIONS ON HOW TO PREPARE AN OUTDOOR MOREL MUSHROOM PATCH. 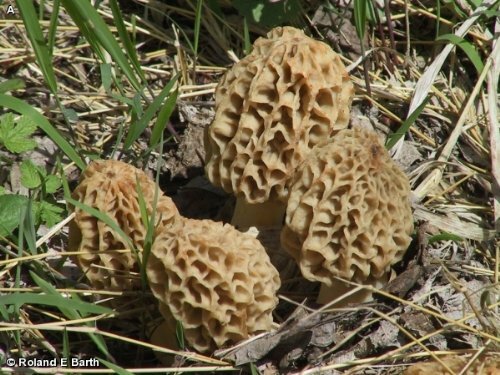 YOU JUST SOW THE MOREL MUSHROOM SPAWN, MAINTAIN YOUR MOREL GARDEN, AND PICK AND ENJOY POUNDS OF FRESH MORELS EACH SPRING FOR YEARS AND YEARS TO COME. OUR MOREL MUSHROOM KITS WILL COME TO YOU AS FRESH AS CAN BE, AND SINCE IT IS MADE TO ORDER YOUR KIT CAN BE HELD IN A REFRIGERATOR FOR UP TO 5-6 MONTHS PRIOR TO USE! The Great Morel Mushroom is one of the most well know and sought after wild mushrooms available. Gourmet chefs from around the world pay top dollar to get their hands on these incredible and rare mushrooms, and now you can grow them in your very own back yard! The mushrooms delicate balance of earthy, nutty and smokey flavors combined with the amazing meaty texture makes it a delicacy worldwide. These elegant mushrooms also bring a wonderful aroma and flavor to sauces and just about anything else they are added to. PLEASE NOTE: THESE KITS ARE GROWN TO ORDER AND WILL TAKE 2-4 WEEKS TO BE READY FOR PLANTING. THIS ENSURES THAT YOU RECEIVE THE FRESHEST POSSIBLE MUSHROOM SPAWN. Start growing morel mushrooms by spring! You will need a 4 x 4' space for planting. You must have 6 weeks of freezing winter for best results. Full instructions with every kit.